We are so delighted to welcome Isabel back to Kula after her travels. 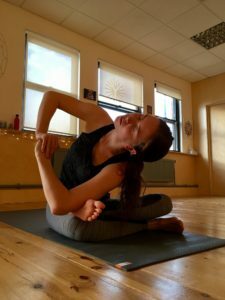 You will be pleased to see her name back on the timetable next to her regular classes and a brand new regular 8am Sunday morning Hot Vinyasa Flow class and some exciting pop-up classes in May. I’m used to traveling around for work, auditions, workshops, training, summer schools, or projects. There was always something happening. I always had this longing to travel just for the sake of traveling and not being tied down by a schedule or by obligation. This is why Anthony and I decided to from take time off from everything and go to India. We had a rough plan to go from the south-west state Kerala al the way up to Rishikesh in the foothills of the Himalaya. We didn’t book any yoga courses, the idea was that the traveling was going to be our learning course. Of course we brought our yoga mats with us and we would start the day at 6am with our own yoga practise every day. It felt amazing to finally have the time and space to be able to do a 2-hour practice in the morning, but what became clear soon enough is that no matter where you are its hard to silence the mind. What I really noticed is how used I am to have a ‘to do lists’ in my head. Even when I was away from it all. I noticed during my practice that vritti’s of “must do this” kept on disturbing my search for silence, but slowly after a couple of weeks I managed better with letting go of these disturbances. Moving through the busy city’s in India I remembered the quote of Judy Dench in Marigold hotel ‘India is an assault on the senses, its a riot of smells and colour.’ It’s amazing and at the same time extremely challenging. Although religion is a really prominent thing in India, I kept trying to find the source of yoga around me. As I found it hard to find in everyday life around me. Everyone wants something from you, most of the time money or a “selfie”. There is no silence anywhere. The streets and even nature are filled with trash, people push in front of you (hold your breath Brits there is no queing system here). Almost everywhere we have been is heavily polluted and in society, there is extreme inequality between rich and poor and in my opinion man and woman. So where is the yoga? I loved seeing the spiritual rituals of the people of India which came in many different forms, Puja’s, going to the temple, bathing in the river, singing, taking care of your family, and feeding the animals. The fact that in India family is number one was a big lesson for me, there is this sense of community and this duty to always be there for your family. It’s something that slipped away from me in the west, because I’m always so busy and because I live far away from my family. I love my family so much and I feel so grateful for them, but I often forget to tell them. So this is one of the teachings that India gave me. To show more love and gratitude towards my family and the community around me. There are a lot of street animals and what is beautiful to see is that people and animals share the space together and each living being has its own ancestral right to be here. Cows, dogs, monkeys all walk around in the streets. In the evening you see people putting any left overs from their dinners out for the cows and dogs. People travel on their bike with a bag of food to feed the birds or the monkeys, as an act of selfless service ‘Seva’. I love this. Ever since I was a child I had an extreme love for animals and felt that it was not right to see them as something separate from us. I used to be a WWF Ranger as a kid and would collect money and raise awareness for animal causes and I remember confronting hunters in the forrest near my grandparents house. Thinking back I was a little activist then. Now that I’m in my adult years I have been vegetarian for 10 years and last year went vegan, but being in India and seeing the seva towards the animals has lightened my activist fire again. To practise selfless service towards all other living beings. At the end of our trip we arrived in Rishikesh just in time for the International Yoga festival at the famous ashram Parmath Niketan on the banks of Mother Ganga. It felt amazing to retreat here surrounded by yogi’s, teachers, swami’s and holy wo/man. In the evening there where the Aarti’s, a music and fire ceremony. I felt in love with the power and devotion of kirtan (singing yogic chants). The singers and musicians where outstanding and being close in a group on the banks of mother Ganga listening and joining in to this devotional music, really made you feel this sense of belonging. As if finally everything was alright. During the festival there where spiritual lectures and talks from Swami Sadvi, Bruce Lipton, Swami Paramadvaitiji, Ven. Bhikkhu Sanghasenaji teaching you about the importance of love. To practise to really love and this comes with gratitude and compassion. My teacher Ana forrest was teaching classes at the yoga festival and it felt amazing that after 2 years to now be in her classes again. Also the teachings from Jivamukti teacher Jules Febre made a huge impact on me. He spoke with such wisdom, but also made things so simple (in a good way). He managed to blend the yoga teachings of the ancient text with all things we deal with in modern life, this whilst leading you through a sweaty challenging vinyasa flow class. Sharon Gannon the founder of Jivamukti was also present at the festival, unfortunately, she got ill and couldn’t lead any of her classes, but I feel very blessed to have been in her presence and say hi to her when we passed each other in the Parmath Niketan gardens. I was so inspired with Jivamukti that I found the Jivamukti book from Sharon Gannon and David Life in a bookshop in Rishikesh and read it all. 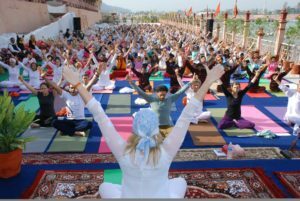 I love how they bring yogic tradition to modern times and that they can blend it with music and art, but what really made a huge click in my head was the yoga activism. I can bring my love for animals and yoga together. Wow. Jivamukti inspired me a lot and made me thinks how I can put more of the Jivamukti teachings in my own classes back in the UK. I really like using music to create an atmosphere throughout the yoga class. I want to bring in more yoga philosophy, but at the same time keep the challenging vinyasa flow class. I really think that when you lead people through a challenging and sweaty class the devotion to something else rather than the small self is important. During a challenging yoga practice the ego can really come up and emotions can surface. Heat is being built and we want to be stronger, more flexible, be better and push our limits. Can we use the heat we build, the hard work we go through, the beliefs about our own limitations. Can we devote this to someone/something else be it a friend, family, God, animals, mother nature, so our yoga practice becomes a selfless service. ‘Seva’. This way we can go beyond our own emotions and thoughts that come up during the practice and yoga can start. To not see our selves as separate but as one with everything around us. I start a new Sunday Morning hot vinyasa flow class at 8 am. It’s a class for the yoga devotees and early risers, that want to start their Sunday with setting themselves up early for the rest of the day. We will start the class with setting an intention and move through a sweaty vinyasa flow class ending the class with a short meditation and with the intention to take the teachings off the mat into the rest of your Sunday.